Thinking of an in-ground pool? Let Perry's Pool Shop help you create your own backyard "Perrydise". If you can dream it, we can build it. We offer a wide variety of in-ground pools including custom-designed luxury freeform pools, lap pools and standard pools. We can also incorporate designer steps, benches and tanning ledges that will allow you to utilize your vinyl liner swimming pool in a manner that best fits your lifestyle and with a look that is sure to turn heads! Our design team will work with you to ensure you get the pool of your dreams. 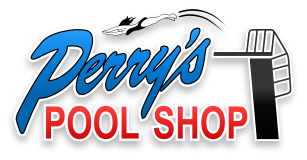 Perry's Pool Shop has many styles to fit a variety of backyards and budgets. Let us help you to create your very own backyard Perrydise! The stunning shape of the Grecian series will fulfill all your poolside fantasies. Fluid lines and beveled corners highlight the Grecian's contemporary design and suggest a luxurious installation with all the amenities of the good life. Due to its favorable design, walk-in stair location is easily available in triple option in 6 or 8-foot widths. The Rectangle is available with 2' or 4' radius corners with traditional 8' wide stairs. Also available to the 2' radius rectangle is the 6 foot and extra wide 12 foot built-in stairs. Our Patio series features an octagon or ten-sided design that conforms easily to small or odd-shaped spaces. Available in two sizes, the Patio pool is large enough to provide plenty of room for fun and swimming, and comes with a variety of attractive bottom designs. An 8 foot optional stairway provides easy entrance and exit. With its compact size, you can tuck the Patio in almost any corner of your property for a summertime getaway. The Roman End is aptly named, for with its generous proportions and classical shape, it lends a bit of Italian romance to any property. The Roman End will become a striking focal point in your backyard and its sophisticated design will set the tone for your summer leisure time: an early morning swim perhaps, an afternoon of sun, a poolside feast in the evening. Choose one-piece Tread-Loc steps or luxurious Radius 12-foot built-in stairs. A pool of grand dimensions, the true radius Oval issues an invitation to all serious swimmers, for it has plenty of room to go the distance. Its generous proportions are balanced by its streamlined shape. Unitized radius panels, coupled with 2.35 ounce galvanized steel, make its construction formidable and durable. Optional 8-foot wide radius one-piece Step-n-Rest provide safe and easy entry. With its meandering lines and unusual shape, the Kidney series makes a grand architectural statement. 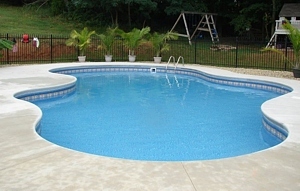 It glimmers with sophistication and is the ideal pool to add an air of elegance to your home. Its aesthetic artistry is backed up by engineering excellence for its unitized panel construction gives an exact matching radius to each section. Choose between 14-foot wide inside radius stairs or one-piece 8-foot wide radius Step-n-Rest. With the Mountain Lake series you can transcend the limitations of your own terrain and create a lakeside retreat. You can specify the Mountain Lake in any shape, a range of sizes, and design its contours to echo the curves of your landscape. With its superb engineering, unparalleled construction, and natural look, the Mountain Lake pool will give you the pleasure of a lifetime. As well as specifying the shape, you can also specify options like inside radius 12 foot built-in stairs or 8 foot radius one-piece Step-n-Rest. With its distinctive shape, the elegant Jewel series will add royalty to any home. A true gem of a design, the Jewel has commodious proportions, generous enough to encourage even the most active swimmers. Our optional 8 foot wide stairway adds convenience and safety. It has its own unique style. Just like you. Yes, we have a wide selection of standard sizes and shapes, including our free-form Mountain Lake series. But sometimes you want or need a shape that's really different. A pool that is completely customized to your particular corner of the world. Just let us know. We love a challenge.